We have always been regarded as an excellent garage door service provider, but we also offer excellent gate repair services. We know that both home and business owners have different needs when it comes to fixing and maintaining these automated systems, and we do our best to meet all of those. 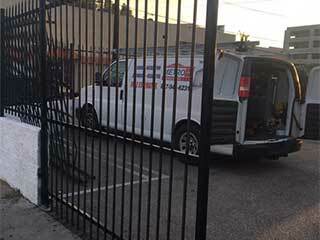 Our experts are dedicated to providing quality gate repair and installation. We can also install openers and intercom systems as well. There are several reasons why an automatic driveway gate would need repairs. If you notice the chains to be very loose, if the gate slams against the post when it opens or closes, or even if it keeps making a squeaking or grinding noise while in motion, you better have a professional check things out. If any part has become too rusty or damaged, it will need to be repaired or replaced. A lot of people prefer wrought iron gates because they are durable and decorative at the same time. They can also be customized according to the customer’s preference, which tends to create an artistic outcome. Wrought iron can lend a prestigious look to entrances, gardens, yards, and even commercial properties. If it suffers from rust, or if it gets damaged and needs to be welded, our technicians can help. Many of today’s homes and buildings are guarded by automatic system, whether it's an office building or a gated community. The device that turns these gate systems automatic is the opener, and it too can suffer from a variety of issues. From nut limit needing adjustment to circuit board issues and even a worn-out motor gear. There are plenty of things that can render your gate system inoperable. The best way to prevent this is by making sure your opener is routinely maintained. Our technicians will inspect every part of the unit, and repair or replace on the spot anything that doesn't meet our standards. Our experience puts us ahead of the competition. We combine this with continuous training to hone our skills and update our knowledge with the latest advancements in the industry. If your gate system is suffering from any type of problem, give our experts at Garage Door Repair Evanston a call right away.